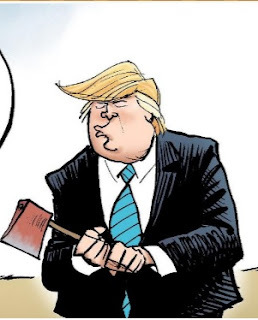 Blogodidact: "...President Trump took an ax, gave the Govt Agencies 40 whacks..."
"...President Trump took an ax, gave the Govt Agencies 40 whacks..."
Here's another case of my 'partial good/potential bad' take on Trump, that has me both cheering, and sighing, at the same time. A friend brought it to my attention that, along with his many other recent actions against regulatory excesses, Trump's people are apparently planning on severely reducing the size, or even existence, of a number of federal agencies. As you might expect, that makes me cheer! But the reported reasons for it... 'budget savings', leaves me somewhere between a 'meh' and a sigh. As I commented to my friend, IMHO, the budget should not even enter into the question, and if it does, then they either don't understand the question, don't understand the budgets, or are weakly using budgetary reasons as excuses to cut what they feel some vague ideological compulsion to do. But if it was me that had the power to swing the ax, the very first ones that I'd cut, would be the National Endowments for the Arts, and for the Humanities. They'd be the first to go, because they are the most extreme examples of why they all should go (with the possible exception of the 'Community Oriented Policing Services', and 'Civil Rights Division (though I strongly suspect a cursory examination would show them to be worthy in name only)), which is because the Federal Govt has no justifiable purpose or power for involving itself, and us, in them. And also because, above almost any other institutions in society, I care about the Arts and Humanities the most. The inevitable result of political powers involving themselves in the arts, is the contamination, degradation and corruption of them that has to follow from the politicization of artists and their art. As to all of the other agencies, I'd gleefully sever them from the public teat, because they are ideological perversions of the public trust, justice and the rule of law, which operate under the barest pretexts of furthering 'the greater good'. These 'Federal Agencies' are blights upon the land. "Some of President Donald Trump's planned budget cuts appear to be targeted more at undercutting Democratic priorities than at shrinking the national debt." , but this sure as hell isn't! "the following 17 ... federal agencies reportedly on the chopping block..."
Though I wholeheartedly agree with 16 of your targets. I know that Office of Community Oriented Policing Services is worthwhile. The question is: Do we want police who serve the community, partner with the community, thus are far more effective at stopping crime and finding the perps of the remaining crime. Lets pick on the jackbooted thugs in Collinsville Ill. They wait for US Citizens to drive in their stretch of Interstate. Intercept them and take their valuables under "civil forfeiture"... where they are stealing from the citizens under the color of authority. Lets pick on Pine Lawn where the Asst Police chief has his cops follow him and his tramps home so they don't get DUI's. He has his officers pull someone over and steal thier license plate with 2 year tags so his unregistered truck has tags. His mayor is in prison for making a deal with the tow truck owner... my tiny town will give you so many impounds a week, and you pay me $300 a week. Is this the justice you want? Officers would now get great intelligence from the neighbors they befriended. Violent Crime has gone to near zero, and solving the remaining crimes has gone to 100%. for the ol, precocious Don.